Jane's very attached to this book, and while I am not always 100% with them on the quality of layout (example: 5 strawberries are illustrated with 3 of the strawberries that are exactly the same just cut and pasted! ), it's a good simple book with colorful pictures and more than just numbers, colors and shapes -- also a few emotions, some opposites (Jane's favorite is UP/DOWN) and schedules. I think we'll be getting a few more of these books or at least adding some to our Amazon wish list. 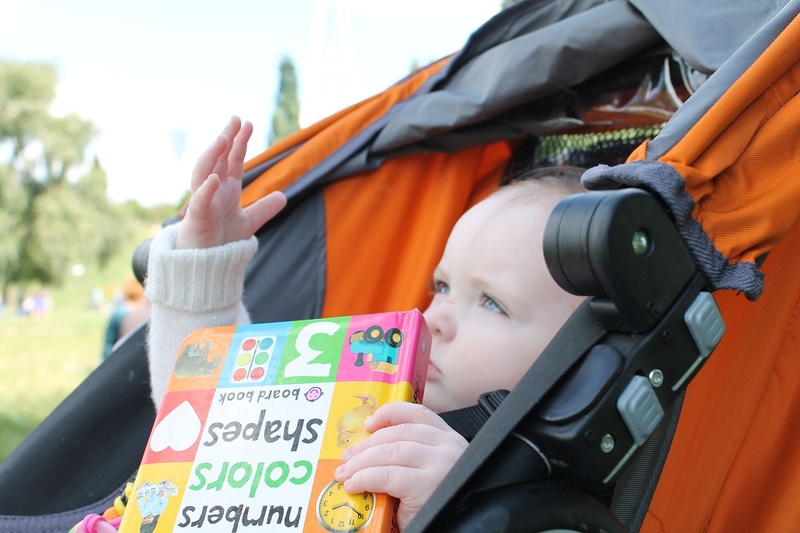 Jane in her City Mini stroller (2011 version in orange/grey) with the Numbers, Colors, Shapes book and her signature "you are my people" hand gesture. For travel we bought the stroller carrying case, which is good but not as good as the one we saw parents use several years ago when we were traveling back to NYC -- their carrying case had individual pockets for the wheels, but this newer version cheaps out and doesn't have that. A gift from Coretta. I'm pretty sure it's MY favorite book of Jane's (hence making this list). It's just a sweet story, and if I weren't a stickler for copyright I'd probably make a Jane version with pictures of all the things I love about her to match the book (happy side, sad side, fingers/toes, ears/nose, hair/eyes, etc.). We picked this up at a garage sale for 50 cents. It's a 50s-era story about a kid going to bed. It's part of our night-time routine, along with Llama, Llama Nighty Night (a gift from Aunt B) and Good Night, I Love You (illustrated by the same person as I Love You Through and Through, so when I saw it at Target I bought it!). I can recite all three of these from memory. Disclosure: Amazon affiliate links used throughout. Edit: Update, Jane loves her Numbers, Colors, Shapes book so much that she ATE the corner of the pink page. GROSS... And should be expected, as she's already cut three teeth and more are surely on the way. She has a queenly facial expression to go with her royal hand gesture. Yes Jane, we are your people.